EXPOSED is a series of events by young people, supporting young people who otherwise would not have a platform to showcase their work. The events and the space will bring together a number of young, struggling artists and their work to the attention of audiences they otherwise would not reach, giving them the opportunity for exposure and to flourish. 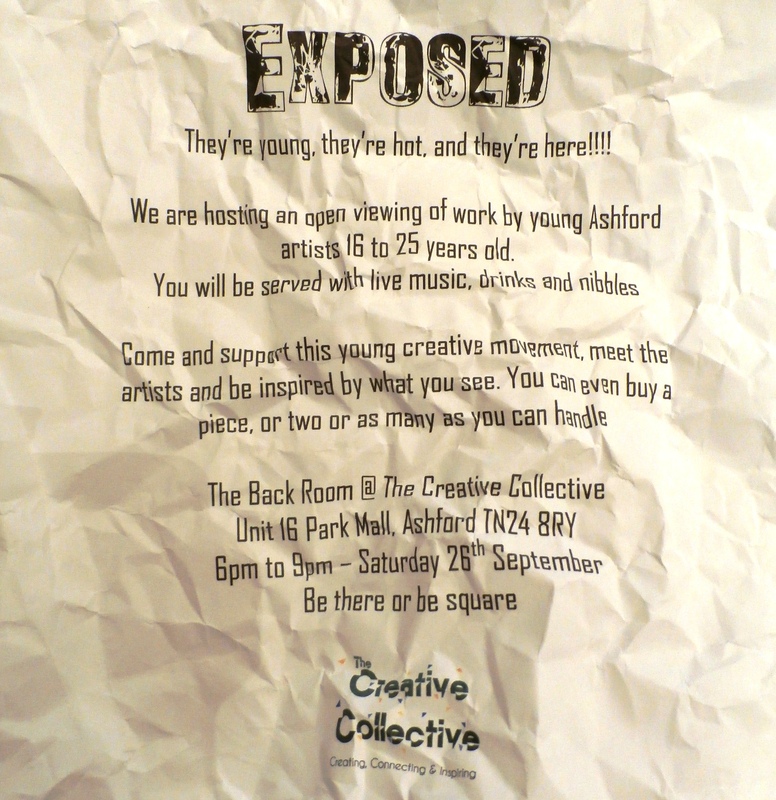 There are a lot of young, talented and ambitious artists in Ashford that benefit from The Creative Collective, and whilst we are happy to offer young artists the opportunity to showcase their work, you can see these people, their work and this town boom. Part of the service offered by the TCC, which is specifically beneficial to developing artists, is the opportunity to be coached/mentored by local business owners and managers so that they are able to advance their career or consider other training and/or educational options. We aim to help artists to be original, disruptive and different, and we always need your help to achieve this. EXPOSED is an event by young people, for young artists. We are Chloe, Maria, Scott, Paul, Tom, Sherri, Harry, Tiger and a few more who are involved occasionally and work on special projects, all 18 to 25 years old, some of us with business or creative degrees and others having left school or college recently. EXPOSED is a platform to launch the young artists who all too often, don’t have the confidence and the finances to present themselves or their work. The artists are ready to emerge with a large number of high quality pieces, and we need to move forward now and get their work out there. If you are a business ad would like to be involved and help us, please email exposedashford@gmail.com. We can arrange to meet with you and tell you all about our work and how we are involved in and with The Creative Collective and what we are trying to achieve, and look at how you may be able to help us take our work forward. Written by Maria Connolly and Paul Fellowes.